The 1982 Antwerp Advanced Study Institute on "Physics of Polarons and Excitons in Polar Semiconductors and Ionic Crystals" took place from July 26 till August 5 at the Conference Center Priorij Corsen- donk, a restored monastery, close to the city of Antwerp. It was the seventh Institute in our series which started in 1971. This Advanced Study Institute, which was held fifty years after Landau introduced the polaron concept, can be considered as the third major international symposium devoted to the physics of pola- rons. 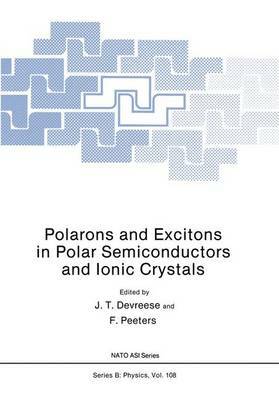 The first such symposium took place in St. Andrews in 1962 under the title "Polarons and Excitons" [I]. The early theoretical developments related to polarons were reviewed in depth at this meeting; the derivation of the polaron hamiltonian by Frohlich, the Frohlich weak coupling theory (and the equivalent weak coupling canonical transformations), the Landau-Pekar and Bogolubov strong coupling theory and the Feynman polaron model formulated with his path integrals. The main emphasis was on the polaron self-energy, effective mass and mobility. From the experimental side the first evidence for polaron effects was provided by the pioneering cyclotron and mobility measurements o~ the silver halides by F. e. Brown and his group. Also the significance of polaron effects for the under- standing of excitons in ionic crystals was a central topic in St. Andrews. The second Advanced Study Institute concerning polaron physics was organized at the University of Antwerp (R. U. C. A.